This 1980’s era home had experienced several serious flooding events at the lowest point of the property—an unfortunate side effect of the dry creek running behind the yard. The owners combined their need to permanently fix these issues with their desire to update the home’s finishes, which resulted in a dramatic total interior and exterior home transformation. From inside out, this renovation left no space untouched. Every room was updated, from the new chef’s kitchen and modern living room in the expanded square footage of the ground floor, to a unique floating tread staircase leading to a completely new layout on the second story. This comprehensive remodel elevated both the function and the style of the entire home. This finished home has two characters: a regional, rustic charm on the exterior and a sophisticated, contemporary elegance on the interior. The exterior stays true to a southwestern style—with a mix of stone, siding, painted brick, and a standing seam metal roof—while still incorporating modern touches that updated and modernize the facade. Inside, the home is characterized by compositions of overlapping forms and a mix of materials, giving it a wholly unique, contemporary feel. Doubled in size by pushing the adjacent breakfast area further into the rear yard, the kitchen is a modern, expansive space, perfect for gathering and entertaining. Rich dark cabinets and sparkling black countertops add a touch of elegance. In the backyard, a new covered patio extends along the rear wall of the house, providing covered outdoor seating and dining area adjacent to the new pool and spa. The widened exterior wall expanded the living room and made room for a large TV/media wall. Upstairs, the old master bedroom was converted to a larger suite with windows on three sides and includes a new master bath with a walk-in closet. Even without the water damage issues, this home was closed-off, dark and dated. The floorplan as it existed confined the living space, and tired finishes left the homeowner with a place that didn’t truly reflect their personality or style. 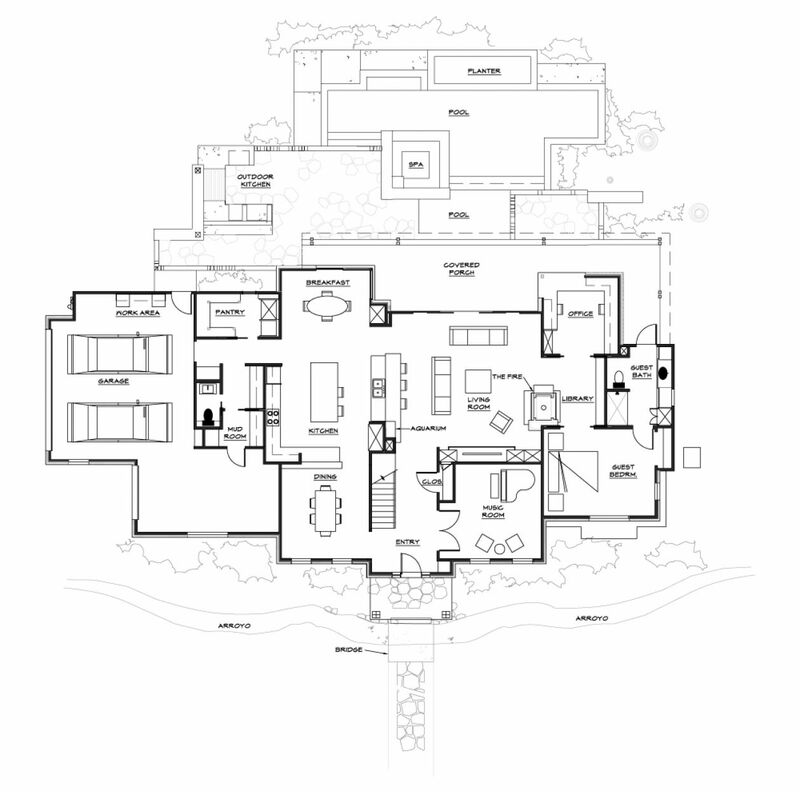 highly detailed planning and coordination was essential for every stage of this project. Careful planning during the rough-in stage allowed intricate details—such as lights in the new pair structural steel beam that separates the kitchen from the living room, the dual custom concrete bars at the kitchen and dining areas, and the structural supports of the awnings—to be implemented seamlessly into the design. includes a new system of berms designed to redirect floodwaters away from the house and into the creek behind the house. So as not to penetrate the berms at the street, an entirely new stepped entry element was created, with a large steel planter and stone walls to match the home’s exterior. A new drystack stone “arroyo” in front of the house acts as a backup flood control element, should an excessive amount of water ever penetrate the berms. that fits the lifestyle of this active family. The innovative mix of forms and finishes were accomplished with a high degree of craftsmanship and careful detailing. Most importantly, there are multiple safeguards in place to protect the owners’ investment from even the severest of storms.